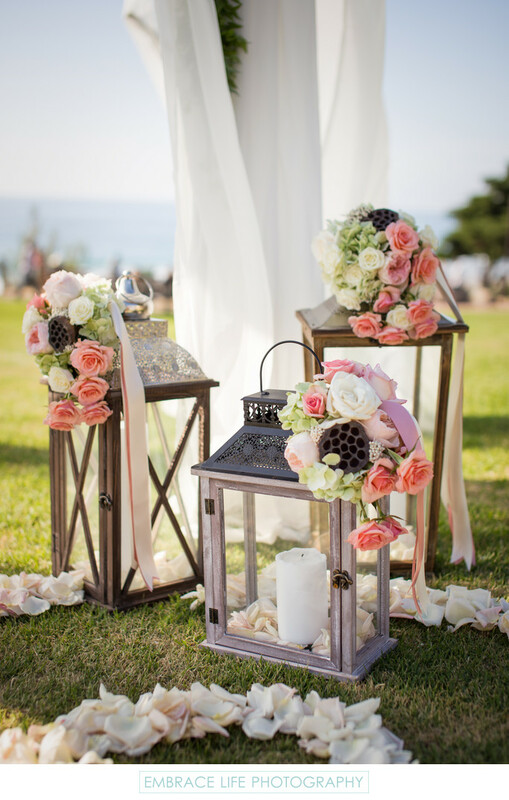 Rustic lanterns filled with candles and flower petals, adorned with colorful, natural flower arrangements and soft pink satin ribbon, rest at the foot of the chuppah in Seagrove Park where this Del Mar beach wedding was held. The ends of the flower petal patterned ceremony aisle runner designed by Jennifer Cole Florals can by seen at the lower edges of the frame with the San Diego wedding venue's ocean view backdrop near the top of the frame. Location: 1540 Camino Del Mar, Del Mar, CA 92014. Keywords: Ceremony (333), Details (1125), Flowers (471), Wedding (1437).